Greg Beckwith is a 1992 graduate of the BIR program at Red Wing and has a BS in Technical Education from Bemidji State University. He has been involved with the college's repair program since 1996 and has been teaching full time since 2003. For further concentrated study he spent time in Oslo, Norway learning horn building from Daniel Rauch of Rauch horns. Greg is a member of NAPBIRT and as a master clinician has presented clinics for conferences regionally and nationally. 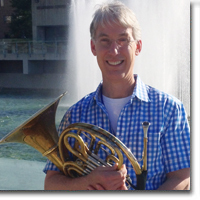 He has also given presentations on maintenance and emergency repair for band directors and musicians at The Midwest Clinic’s International Band and Orchestra Conferences, Minnesota Music Educators Association conferences, and International Horn Society symposiums. Greg is also an accomplished horn player, having played professionally around the world and as an extra/sub with Minnesota Orchestra. He is a graduate of Interlochen arts Academy and studied with Verne Reynolds at Eastman, Roland Pandolfi in St Louis, and Kendall Betts in MN. He continues to perform in Minnesota as a free-lance musician and has presented master classes combining horn playing with repair to school musicians around the area.